This tasty vegetarian entrée gets its unique flavor from the combination of garlic, onions and spices. These help you maximize flavor without adding as much salt. Heat 2 Tsps.. olive oil in a large saucepan over medium heat. Add diced onions and garlic, and cook until onions are soft. 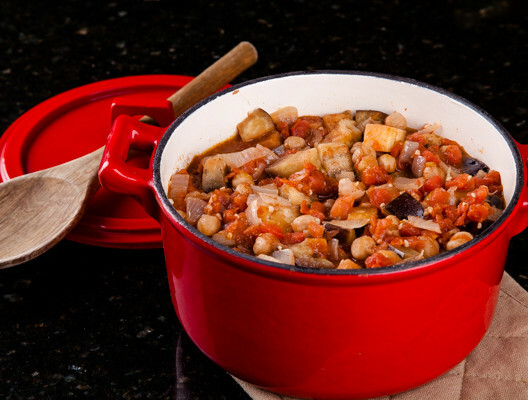 Stir in the eggplant, chickpeas, cumin, cinnamon, coriander, tomatoes, salt, and pepper. Increase heat to high, and bring to a boil. Reduce heat to low, and cover the pot. Cook the stew for 45 minutes to 1 hour or until eggplant is very tender. Meanwhile, heat remaining 2 Tsps.. olive oil and add onion slices. Fry until golden, and remove from heat. When stew is finished, place in serving bowls and top with fried onions and cilantro.